Thirteen-year-old boy at the Centre de Transit et d'Orientation, a UNICEF-supported reintegration centre for children associated with armed groups, in Kananga, Kasaï region, Democratic Republic of the Congo. Despite the relatively peaceful passage of December’s presidential election in the Democratic Republic of the Congo (DRC), the UN Special Representative to the country told the Security Council she “remained concerned” over developments in the east, where dozens of armed groups continue to operate. In briefing the Security Council on Monday, Leila Zerrougi said that in North Kivu the ongoing deadly Ebola outbreak in the Grand Nord region, was the second-largest in history; and militias continued to attack civilians and Government forces – known by the French acronym FARDC - as well as humanitarian workers and personnel from the UN Stabilization Mission (MONUSCO), which she also heads. She said MONUSCO was “sparing no effort” to protect civilians and to support FARDC and national police units. Following recent attacks against Ebola response centres in Butembo and Katwa, MONUSCO has redeployed additional personnel for security assistance and to address community resistance to the response, she told the Council. Meanwhile, preparations continue in the area for upcoming national and provincial elections at the end of March: “We will be doing our utmost to prevent and mitigate any risk of violence throughout this politically sensitive period” spelled out Ms. Zerrougui. Turning to South Kivu, she noted that clashes have “flared up” between community-based militias, “resulting in significant displacements of the population, with the potential of further deterioration”. To address this, she said MONUSCO was supporting a reinforced Government presence in addition to “our own Standing Combat Deployment, and our intercommunal mediation efforts”. 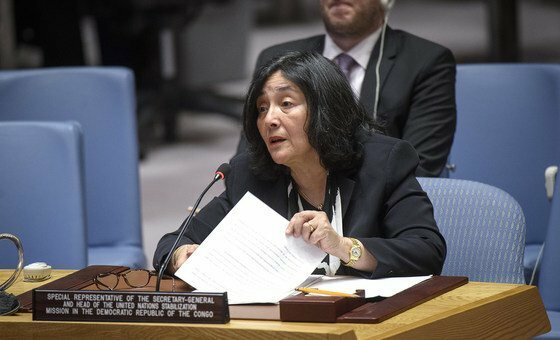 Ms. Zerrougui noted that while the Government has shown “a genuine willingness” to respond quickly, its national security forces need bolstering. “In North and South Kivu”, she lamented, “structural violence is profoundly entrenched, and conflict dynamics related to identity, access to land and resources, and regional issues have taken deep root in the fabric of everyday life”. To sustainably address this, the UN envoy asserted that “concentrated engagement will be needed in the period ahead”. Ms. Zerrougui also updated the Council on the mass inter-communal killings around Yumbi in the west, on the banks of the Congo, which took place in mid-December, with her office and UN human rights workers later documenting 535 deaths, 111 wounded, 19,000 displaced and destruction of many homes and livelihoods. It was “a troubling reminder of how quickly violence can escalate”, she said. She said the Government needed to be encouraged to better prevent and address potential causes of violent conflict overall. The MONUSCO head encouraged the Council to continue supporting what has been achieved in the country, as well as to assist the DRC in addressing its remaining threats to peace and security. Despite protests by some parties and politicians who lost out, over the conduct and results of elections held on 30 December, Ms. Zerrougui told the Council that it was the first peaceful handover since independence, and “most Congolese citizens were pleased to welcome the inauguration of President Tshisekedi”. Calling it “a decisive step to establish democracy and rule of law” in DRC, the MONUSCO head acknowledged that the reactions of “certain political parties and their supporters” to the outcomes of senatorial elections last week “are a concern”, as “they reveal the fragility of the political process in the country”. Ms. Zerrougui confirmed that the President Felix Tshisekedi’s commitment to work towards consolidating peace, the rule of law, democracy and human rights, was being bolstered by “tangible actions”, specifically in his efforts towards “allaying tensions”. She noted the recent release of some political prisoners, adding that politicians had been meeting freely throughout the country “without obstruction” and the return of political exiles was expected. In conclusion, Ms. Zerrougui urged the Council “to support the Government in its efforts to honour the expectations of the Congolese population; to advance political dialogue and collaboration; and to seize the opportunities which we are now seeing for a sustainable reduction of armed groups in some areas”. Briefing by teleconference from the capital Kinshasa, Anny Tengandide Modi, of UN Women’s African Women Leaders Network updated the Council of the “situation and plight of women and girls in the DRC”. She noted the Council’s commitment in acknowledging the leadership of African women in the peace and security field by adopting resolution 2457 last month and spoke at length on the elections. Ms. Modi voiced a number of concerns, including the detention of protestors “on flimsy grounds”, a lack of awareness-raising on the electoral process and “many obstacles to the participation of women”. “Despite these shortcomings”, she pronounced the DRC elections “a benchmark for the region and the DRC is at a historical and decisive juncture”, underscoring the importance “that women, particularly young women, are engaged not just in voting, but on consultations in peace” to support the political process and guarantee the country’s stability. She updated that “the DRC has put provisions in place for the representation of women in the security sector in particular to boost the number of women in the armed forces and the police” as part of ongoing reforms. 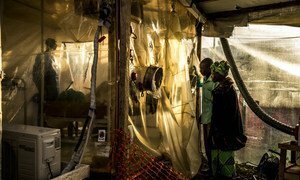 Attacks on Ebola treatment centres in the Democratic Republic of the Congo (DRC), risk reversing the gains made during the current outbreak in the north-east of the country, the head of the UN health agency said on Thursday.